The Department of Chemistry's administrative offices are located in Room 7330 in Stevenson Center. Office hours are M-F 8:00am - 4:30pm. Summer Flex Hours: M-Th 8:00am - 4:30pm and F 8:00am-12:00pm. 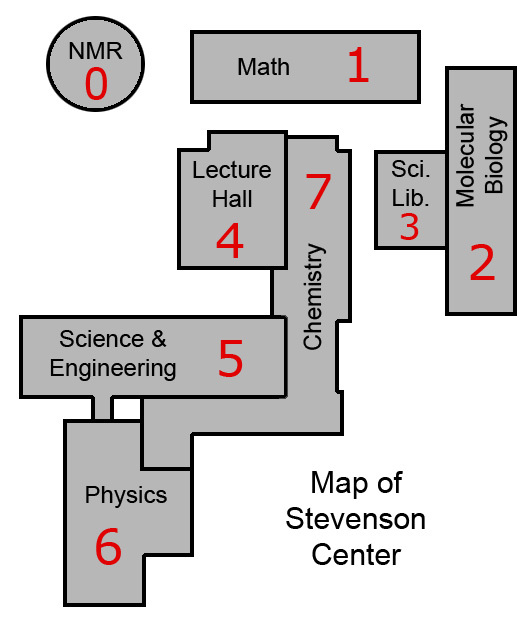 The first digit is the building number (see red numbers in the accompanying map); the Chemistry Building is building number 7. The second digit is the floor number. The ground floor is floor 3, because there are two basements. The Chemistry Building has only 5 floors. Its elevator buttons just indicate floor number. The last two digits give a particular room on that floor. For example, 7333 SC is on the ground floor of the Chemistry Building; to get there you'd press "3" on the elevator. The Wesley Place parking garage is at the corner of 21st Avenue South and Scarritt Place. The address is 2001 Scarritt Place, Nashville, TN 37203. Public parking spaces are 52-170.